With a better understanding of the damage the sun can cause to your skin, the 21st century has seen a resurgence of appreciation back towards the formerly admired “porcelain complexion”. Many people take pains to protect themselves from the sun‘s damaging rays, but did you know there are several other elements that can darken your skin? Poor lifestyle choices, dehydrated skin, stress, environmental pollution, an underlying medical condition or sustained use of chemical cosmetic products can all impact on the colour of your skin. But fear not! The following list explains how to lighten skin naturally. The solution of how to lighten skin naturally is simpler than you may imagine. No need to invest in expensive, brand name products; many of these items you may already have in your kitchen cupboards! A relaxing and simple way to lighten your skin, a milk soak contains enzymes that can lighten skin pigmentation. The inclusion of lemon juice heightens this effect, whilst the moisturizing properties of the milk counteract the drying effects of the lemon juice. To enjoy this remedy, simply draw a bath, then add a cup of full-fat milk and the juice of a whole lemon. Swirl the water to mix, enjoy for at least 20 minutes, and then rinse off with clean, warm water. Rich in PABA (para aminobenzoic acid), ferulic acid (an antioxidant) and vitamin C, rice powder can act as a natural sunscreen as well as aid in hydrating, toning and whitening your skin. How to lighten skin with rice powder? Grind about a cup of uncooked rice into powder, mix with enough milk to make a fine paste, and then apply like a face mask. Leave on for at least 20 minutes and re-apply 2-3 times per week to achieve maximum affect. As a byproduct of milk, yoghurt contains lactic acid, which is known for its bleaching properties. Yoghurt is also rich in nutrients that are reportedly good for the skin, and as such, yoghurt can generally be used on all skin types without causing a reaction. To use as a skin lightener, softly massage plain yoghurt (make sure it doesn’t contain sugar) into your skin, leave for several minutes and then rinse off. For your face, mix the yoghurt with some honey to improve complexion and skin tone. 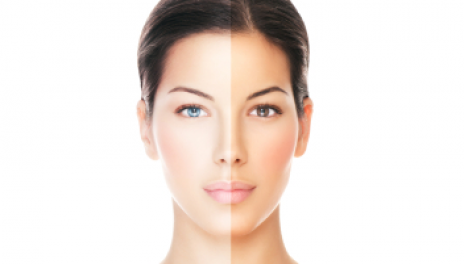 One of the leading causes of uneven skin tone is hyperpigmentation. Aloe Vera can counteract hyperpigmentation by restoring your skin back to its natural tone and regenerating new cells. You can purchase Aloe Vera gel, but for a DIY remedy, simply cut through the outer layers of the Aloe Vera leaf, which will produce a jelly-like gel. Apply this gel to your skin and leave on for around half an hour. Reapply twice a week for at least two weeks. The high acid content of lemons makes them a natural skin lightening product, which, when combined with their antioxidant properties and vitamin C, make lemons a natural remedy for improving the skin. Squeeze fresh lemon juice into a bowl, and then apply to your skin with a cotton ball. Alternatively, squeeze fresh lemon juice directly onto the skin and allow to dry. Leave on for at least an hour to lighten skin tone and prevent scarring. Turmeric, being rich in antioxidants and natural antiseptic, is an ideal remedy for your skins general health. Also, it builds up your skins natural melanin content, which in turn will even out skin tone. The remedy for how to lighten skin using turmeric is quite simple. Mix powdered turmeric with milk cream until you have a thick paste. Apply to skin, allow the mixture to dry and then rinse. Repeat regularly to achieve the whitening effect. Oatmeal is an ideal way of gently exfoliating the skin, removing dead skin cells and encouraging new skin cells to grow. These new skin cells improve skin tone and even out the complexion. Begin by mixing oatmeal with tomato juice and then apply to your skin daily for 20 minutes. Whilst rinsing off, gently scrub the mixture into your skin. Another remedy is to mix oatmeal powder with turmeric and lemon juice, creating a paste that can be applied like a face mask. Papaya has become increasingly popular with beauty therapists as its intense nutrients leave the skin healthy and beautiful. Additionally, the fruit contains natural whitening assets that can encourage lightening of the skin. Papaya can be eaten regularly to cleanse the body of impurities that may cause skin darkening, or else mash the papaya fruit with a cup of fresh lemon juice and apply like a mask. Leave on for around half an hour and then rinse. Surprisingly, considering the colour, tomatoes contain a natural skin bleaching product and it's cooling to the skin and rich in vitamin C. These qualities combine to make tomatoes an ideal natural beauty product. Numerous tomato remedies are available: grate to a pulp and rub into the skin, mix tomato juice with a little lemon juice and apply for 15 minutes, mash a tomato with an avocado and use like a mask or even combine tomato pulp with some natural yogurt and spread over skin. Coconut water has been shown to smooth the complexion as well as assist in the retention of the skins natural suppleness. It has also been suggested that the natural properties contained in coconut water can work towards lightening the skin. To boost your body’s mineral intake and maintain hydration, try drinking coconut water regularly. With regards to how to lighten skin with it, apply to the skin using cotton wool and then leave on. For this reason, it is highly recommended that you consult with your doctor before purchasing skin whitening products containing hydroquinone. Products that do not use hydroquinone will typically contain retinoic acid (from vitamin A) or drugs such as steroids. Natural alternatives include arbutin (plant compound) or kojic acid (fungal compound). Skin lightening creams are useful because they minimize the skins natural melanin, which in turn will whiten the skin tone. Look for products containing vitamin C, arbutin, kojic acid, alpha hydroxyl acids or glycolic acid, as these are all proven to be effective but are generally safe to use. Never use products containing mercury! Always follow directions and monitor your skin for adverse side effects. A safe and simple method for whitening your skin, lightening soaps work to inhibit an enzyme in the skin called tyrosine, which is what produces melanin. Look for products which use kojic acid or licorice extracts, as these active ingredients are natural and will gently lighten skin tone, avoiding unnaturally, chemically white skin. Make sure to use a strong sunscreen, as the skin can still darken when exposed to the sun. Made from a very acidic type of vitamin A, retinoid creams actively exfoliate the skin, removing dead skin cells and promoting new cell growth. Look out for signs of redness, flakiness or skin dehydration, as retinoid creams can sometimes produce these side effects. They also increase skin sensitivity to sunlight, so wear a strong sunscreen and only apply the retinoid cream at night. Chemical peels are like a more intensive version of the retinoid cream, removing the skins top layers which are darker and leaving behind the fresh, light skin beneath. The initial chemical peel can cause a stinging or burning sensation and will generally leave the skin looking somewhat swollen and red for a few days. Your skin will be very sensitive and a strong sunscreen is a necessity. If you have sensitive skin and would like to avoid the process of having a chemical peel, then microdermabrasion could be a great alternative. It “polishes” the skin using a small vacuum with a revolving diamond tip. This is a usually a fairly quick and painless procedure, but beauty therapists recommend having between 6 and 12 treatments to achieve maximum results. Out With the Old, In With the New: The importance of exfoliation cannot be overstated. Remove dead skin cells regularly by using a good exfoliator or a dry body brush to polish your way to brighter skin. Thirsty Skin is Dull Skin: Moisturized skin looks brighter and healthier. Use creamy moisturizers, particularly those containing coconut of jojoba oil, but avoid any containing alcohol as this dehydrates. A Little Sun Is Good, A Lot is Damaging: Protect yourself from sun damage by limiting sun exposure. Cover up when in the sun, apply a good sunscreen and remember to wear a hat. Chemicals Are Not Your Skins Friend: If you have to use strong household cleaning products, such as bleach or ammonia, then make sure you are wearing gloves. These dangerous chemicals absorb through the skin. You Are Beautiful: There is plenty of advice on how to lighten skin, but if you were born with dark skin, it will always be dark. All skin colours are beautiful, so embrace your own and focus on having healthy skin. Server responsed at: 04/25/2019 6:41 p.m.